Sorry its been awhile. I’ve had problems. I decided to upgrade my computer to 64 bit and bring up the RAM to 8 gigs. I then installed x64 Firestorm. I spent two weeks trying to get it to work without success. The whole system would freeze. After testing everything I could, GPU CPU RAM I had to conclude that it was a motherboard ( RAM slots) fault. I am now running 64 bit with 4 gigs of RAM. I am buying a new computer as this one is showing signs of breaking down ( RAM and hard disk ). Its 5 years old. So when I am fixed up there will be more posts. Sorry. Over the year I have had many teachers, all willing to share their knowledge or expertise. I’ve learned loads about sl and during this year I have met incredible people some of whom have changed my life. I have had 4 partners three I met in jy. see sl blog). I met Storm here. Everywhere I have found kindness and thoughtfulness (well with some exception). I have 98 friends easily the majority are jy people. I have met doctors, scientists, graduates in all sorts of things, writers, poets, artists the many who would just say “I love the blues” and mean it. And that’s enough for us all: a love of the blues. Its a place where you feel at home. You get to be known and get treated and greeted like a friend. It is a meeting place. But also it is a community. 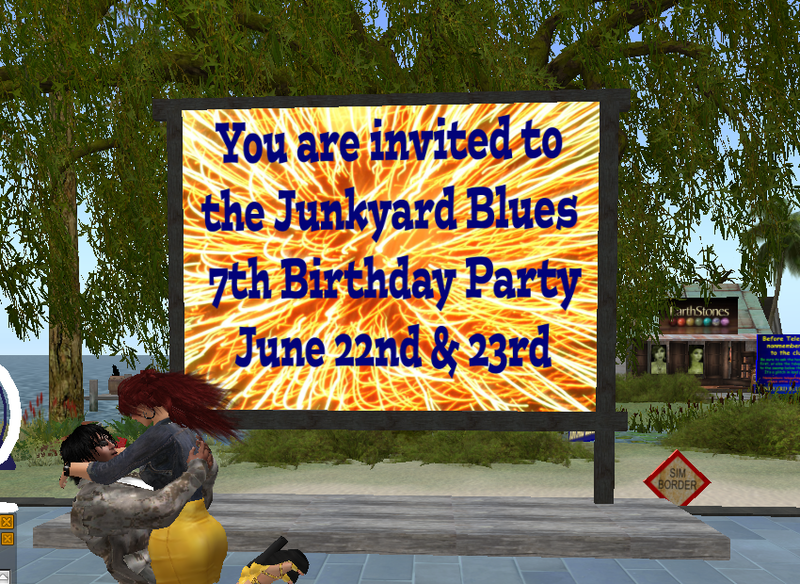 The oldest blues club in second life. Heres a snippet of the birthday party, people paying tribute. I have met 4 of my 5 partners here, the last one will stick I think 🙂 Just like any club you meet a girl and fall in love. You chat you dance you swap snippets of real life and so it goes…. Mon to Wed 6am to 8am Second Life Time (Pacific) and Sunday 2am to 6am slt. I will fix you up with a membership tag. And of course we dance to a live dj spinning the blues. Perfect Great looking avatars, blues lovers, dancing, chatting, grooving. I captured Sianis piece about JY, Bard was hosting and read out peoples eulogies. The Junkyard is much loved. Well done Kiff and Dina you have created something wonderful. You will see some grey its because it takes time to rezz such a lot of avatars in one place. Wonder if server side baking will improve it. However this one I took earlier is better. With Miss Luci Nice Stuff sorry bout the typing. As I was sitting in my cozy little shack, looking out over the water, I realized I needed to say something important. Those who know me understand the last few months have been a trial. Having both old and new friends shield me from the worst of the drama with humor and warmth has been awe inspiring. Bonding with other survivors, those who’ve also felt the pain of deceit and betrayal, some who I’m ashamed to say I’ve inadvertently helped to hurt the same way I was hurt, have still held out their hand in friendship and forgiveness. It’s a silver lining I didn’t expect. (13 people are mentioned) to name just a few, were the rocks I clung to, who sheltered me, for all this time. I don’t know how to repay your love and kindness other than to say I’m doing fine now. Your efforts have not been in vain. Thankyou so much for giving me the room and stability to heal. As you can see those that have been wronged can and do get support because we are a caring community. Up until last week I was out of sorts and a friend asked me if I was ok, another thought I had a black cloud over my head (I did actually) and were concerned. There was no noticeable overt behaviour however people notice. I think the blues helps you to care. The blues is a powerful expression of life’s vagaries, its joys and heartbreaks. And brings solidarity through shared experience. Sometimes its absolutely spiffing. Proud of our community.